Oh this little wreath turned out adorable! It was cute, easy and just a bunch of fun to work with…and the stamp set…ADORABLE! I especially like the free set sent to commemorate 1 million kits. It's lovely…and I have literally the cutest card/page to share with you…Here's a mother's day card using the stamp set included in the kit. My goals for tomorrow are pretty lofty. We have two soccer games, two succulent projects, and I'd like to get the Paper Pumpkin variations out to my stampers. It's a little freebie that I do for my Paper Pumpkin Peeps. I sit down and create 7-9 additional projects using the kit extras and stamp set. It's fun because it's double the value. You use the kit as provided..and then use the extras and a few things you have on hand (or need to order… 🙂 to create a bunch of additional ideas. If you are a paper pumpkin subscriber, awesome…if you aren't..you SHOULD be. Who doesn't like a little magic in the form of a little red box, showing up in the mailbox. Seriously, the day that kit arrives, is magical. Here's a great little card using the paper Pumpkin April Lovely Little Wreath set. Have you made any of these paper flowers? I wonder if I should do a quick video showing how simple these are. 2. 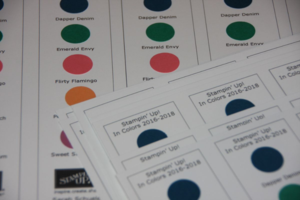 Finish In Color Book Markers and bring class schedules, book marks and book labels to the post office. I'm sending out flyers to my customers receiving catalogs.